Background: Pure SILS has been associated with limited traction, instrument clashing and suboptimal exposure of the critical view especially in difficult cases of acute cholecystitis. This may lead to increased operative time, compromised safety and higher complication rate. We therefore applied needlescopic instruments during SILS to improve gallbladder traction and exposure. We compare this new hybrid needlescopic-SILS technique to the gold standard (laparoscopic) approach in the setting of acute cholecystitis. Patients and Methods:Fifteen patients with acute cholecystitis, (6 males,9 females) with mean age of 42.3 yrs (range 26-54), underwent hybrid needlescopic – SILS cholecystectomy. A SILS™ port was placed at the umbilicus accommodating a long 5 mm 30degreeangle scope and a 5mm dissection instrument. Two (2mm) needlescopic graspers were inserted in the right upper quadrant. Operative time, hospital stay, postoperative pain (VAS score), conversion and complication rates as well as aesthetic results were compared to15 laparoscopic patient controls with acute cholecystitis. Results: No conversions were encountered. Mean operative time was slightly higher in the hybrid –SILS group (100 min, range: 70-130 vs 85 min, range: 60-120, P> 0.05) but did not reach statistical significance. There was no difference in length of hospital stay (2.1±0.35 days vs 2.2±0.22days), postoperative pain and complication rate in both groups. Cosmetic results were clearly superior in the hybrid-SILS group. 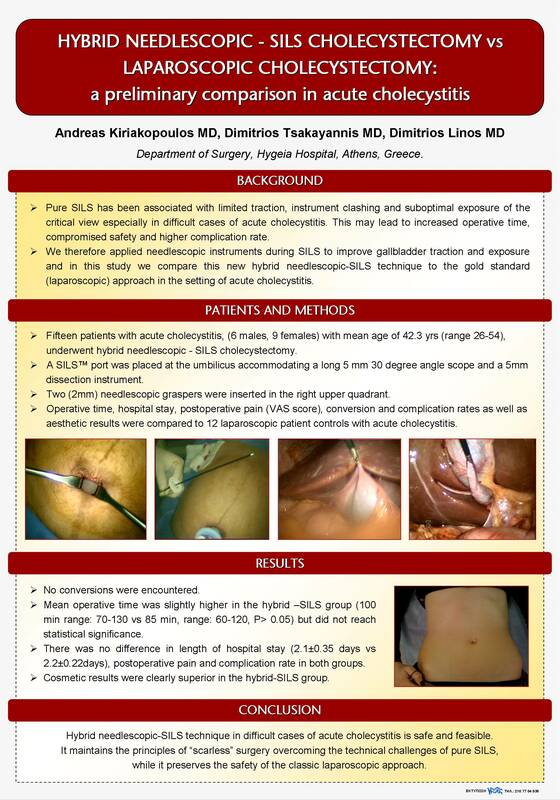 Conclusion: Hybrid needlescopic-SILS technique in difficult cases of acute cholecystitis is safe and feasible. It maintains the principles of “scarless” surgery overcoming the technical challenges of pure SILS, while itpreservesthe safety of the classic laparoscopic approach.